We see a vibrant example of courage and obedience in the book and life of Joshua. He served humbly and faithfully in the shadow of Moses until the Lord took Moses home and chose Joshua to be the next leader His people. I’d be shaking in my size 10 shoes if I had to fill the sandals of Moses! I’m sure that in his humanness Joshua was intimidated too, but he was well trained because he had served under Moses for 40 years. I mean – he wasn’t exactly a spring chicken when God gave him His incredible I-made-you-for-greatness and I’ve-got-your-back motivational talk. How cool is that? Even though Joshua was well along in years when this Biblical conversation took place, approximately 80 years old, God gave him a new job. Can you even imagine? God called him up to bigger responsibilities because Joshua had been faithful with smaller responsibilities. And the Bible shows us that when God gave instructions Joshua obeyed. He moved forward obediently followed as the Lord led him. Just like God wanted Joshua to trust Him with each new assignment, He wants us to trust and follow Him too – no matter our age. When He calls us to new things, we can be strong and courageous because God doesn’t expect us to do it alone. He says we have access to lean on His unending strength instead of our limited abilities. When I feel like I’m in over my head I don’t need to shake in my shoes. And you don’t either. When God tell us to go – to move on to the next thing – to trust Him in a new adventure – we need to go! We need to move forward and expect Him to provide everything we need so that we can be faithful in the small and big. After all, when we depend on God, we depend on the faithful Protector, Provider, Defender, and Guide who will never leave or forsake us. Dear Lord, Thank You for having a purpose for every day I live. Help me to embrace what lies ahead and help me to trust You to provide everything I need to do what You lead me to do. Read Isaiah 41:10. What two things does the Lord instruct us NOT to do in this verse? What four reasons does He give to explain why we shouldn’t do those two things? Why should this matter to you? What is one way you can apply this to your life today? Write a prayer response in your journal or swing over to my blog and write one in the comments section. This is a great reminder as we enter 2018! 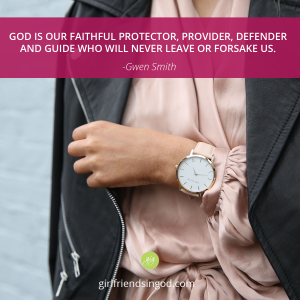 That God will never leave us and is with us every step of the way….I needed to remember this as I step out on faith and find a new church community. I have chosen to walk away from my church after a divorce that has been very public in my church due to ministry position my ex held. I stayed for the past year but decided that in 2018 I will move on to close that chapter of my life. This is a much needed reminder that God is with me and will strengthen me as I move forward. Leaving my church is just as hard as getting this divorce. Keep me lifted girlfriends! Abba, even though each day is a struggle, I valiantly try to not be afraid or dismayed in this world. Your strength gets me through the day. It is Your help that allows me to carry on. It’s a constant battle; but I choose You and the joy You bring into my life to carry me forth each day. I depend on You to hold me up, so I can bring glory to You and Your name. Thank you, Lord for reminding me that I can make a choice not to be afraid or discouraged. When I feel the fear and loss of confidence, I know that I can lean on You and You will give me strength I cannot obtain on my own. I have already won because You are in the fight with me! Amen! Yes and amen. I to have to move on in my career, i think who will want me at 56years old, i just wonder, but i had to leave my last job because of lies and bullying and my marriage to for similar reasons, and so i am in this place of just not knowing where to go and what to do, but God is Jehovah Jireh He will provide, thank you for the call to be strong and courageous God never sets us upto fail, never.